This little street-food inspired, downtown lunch spot serves some of the best vegan sandwiches in Omaha. Housemade seitan is the base for a gyro, shwarma, bahn mi and whatever else the chefs feel like whipping up special that day. Also available are vegan slaw, hummus, fries (done in a separate fryer from their chicken) and onion rings. Vegan cheese and mayo are always on hand as well. 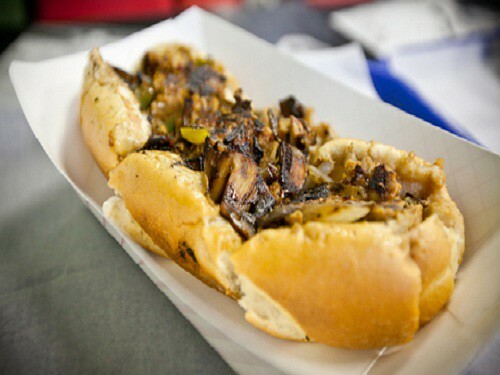 They also offer an eggplant or vegan meat philly steak. My boyfriend is IN LOVE with the vegan gyros. The prices aren’t too bad either! Block 16 is fantastic! They were very helpful in explaining their vegan options. I had a superb seitan wrap that wasn’t on the posted menu. I was so happy they told me about it. It was by far the BEST vegan sandwich/wrap I have ever eaten. They are all very friendly and the beer selection was awesome. I will make sure to go back the next time I am in Omaha. I just wish they were closer! This little spot is great for a quick declicious vegan lunch or a very casual dinner (on Thursdays, Fridays, or Saturdays). They’ve recently added beer and wine to their available offering. At times it can be a bit tough to find parking; I suggest parking in a downtown garage and adding Block 16 to your day walking around downtown Omaha! Yum! They are amazing at explaining the menu to you, they have several vegan options. They have a tofu sandwich that tastes like a fish sandwich, and a vegan peanut butter burger that’s like nothing I’ve ever tried. My husband and I have tried every vegan item on the menu, and every one of them was great. The people that work there are so nice and friendly too.